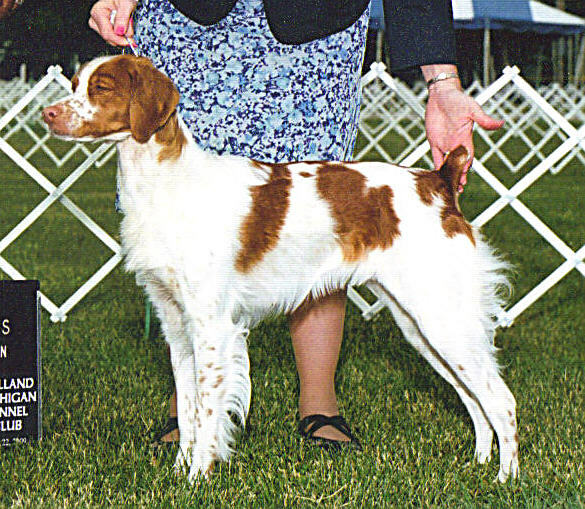 From 1934-1982, it was registered by AKC as Spaniel, Brittany. 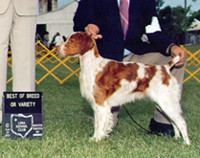 September 1,1982 it's official name was changed to Brittany in the U.S. 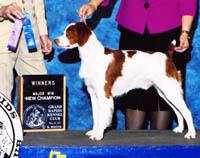 In Canada, it is still registered by CKC as Spaniel, Brittany. each day to maintain his lovely coat. they love people and get along well with other dogs. to the highest point of the shoulders. shall be disqualified from dog show competition. is the same as the length of his body. when measured at the shoulders. to the rear of the rump. A long body should be heavily penalized. Substance -- Not too light in bone, yet never heavy-boned and cumbersome. 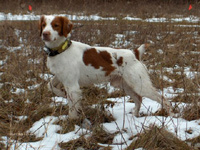 Expression -- Alert and eager, but with the soft expression of a bird dog. though lighter shades of amber should not be penalized. Light and mean-looking eyes should be heavily penalized. Ears -- Set high, above the level of the eyes. 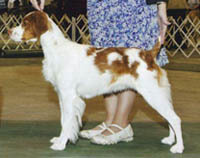 Short and triangular, rather than pendulous, reaching about half the length of the muzzle. Should lie flat and close to the head, with dense, but relatively short hair, and with little fringe. Skull -- Medium length, rounded, very slightly wedge-shaped, but evenly made. Width, not quite as wide as the length and never so broad as to appear coarse, or so narrow as to appear racy. Well defined, but gently sloping stop. Median line rather indistinct. The occiput only apparent to the touch. Lateral walls well rounded. 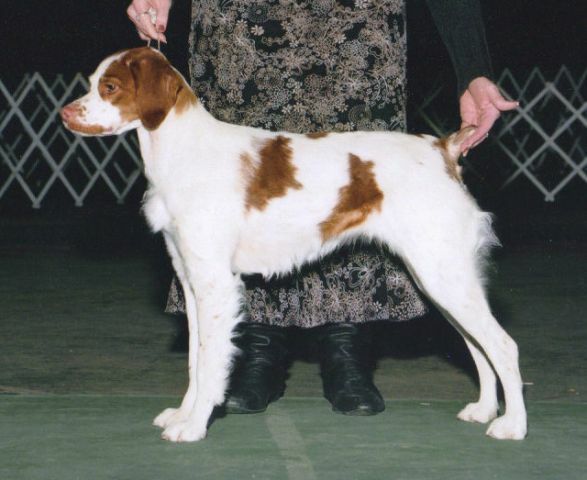 The Brittany should never be "apple-headed"
and he should never have an indented stop. Muzzle -- Medium length, about two thirds the length of the skull, measuring the muzzle from the tip to the stop, and the skull from the occiput to the stop. 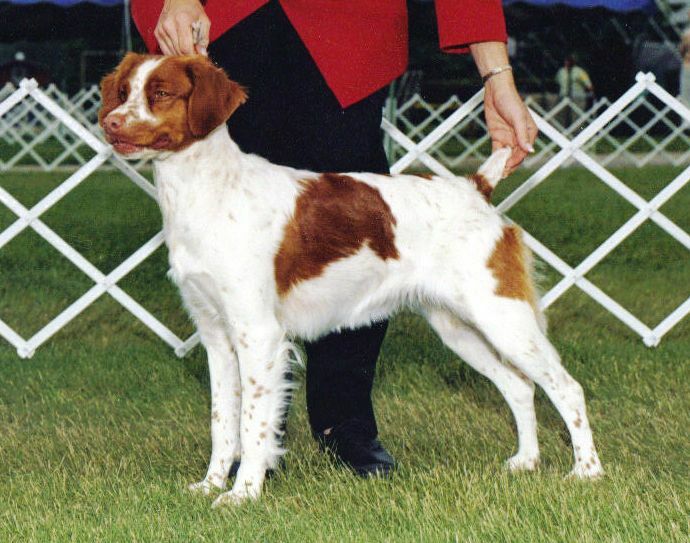 Muzzle should taper gradually in both horizontal and vertical dimensions as it approaches the nostrils. Neither a Roman nose nor a dish-face is desirable. Never broad, heavy or snippy. Nose -- Nostrils well open to permit deep breathing of air and adequate scenting. Tight nostrils should be penalized. Never shiny. Color: fawn, tan, shades of brown or deep pink. A black nose is a disqualification. A two-tone or butterfly nose should be penalized. Lips -- Tight, the upper lip overlapping the lower jaw just to cover the lower lip. Lips dry, so that feathers will not stick. Drooling to be heavily penalized. Bite -- A true scissors bite. Overshot or undershot jaw to be heavily penalized. Neck -- Medium length. Free from throatiness, though not a serious fault unless accompanied by dewlaps, strong without giving the impression of being over muscled. Well set into sloping shoulders. Never concave or ewe-necked. to the root of the tail. Chest -- Deep, reaching the level of the elbow. Neither so wide nor so rounded as to disturb the placement of the shoulders and elbows. as well as width. Narrow or slab-sided chests are a fault. Back -- Short and straight. Never hollow, saddle, sway or roach backed. Slight drop from the hips to the root of the tail. Flanks -- Rounded. Fairly full. Not extremely tucked up, or flabby and falling. Loins short and strong. Distance from last rib to upper thigh short, about three to four finger widths. Narrow and weak loins are a fault. In motion, the loin should not sway sideways, giving a zig-zag motion to the back, wasting energy. Tail -- Tailless to approximately four inches, natural or docked. 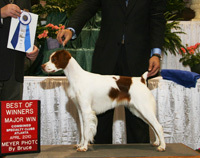 The tail not to be so long as to affect the overall balance of the dog. Set on high, actually an extension of the spine at about the same level. Any tail substantially more than four inches shall be severely penalized. Shoulders -- Shoulder blades should not protrude too much, not too wide apart, with perhaps two thumbs' width between. Sloping and muscular. Blade and upper arm should form nearly a ninety degree angle. Straight shoulders are a fault. 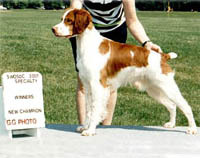 At the shoulders, the Brittany is slightly higher than at the rump. 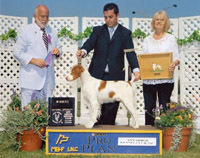 Front Legs -- Viewed from the front, perpendicular, but not set too wide. Elbows and feet turning neither in nor out. Pasterns slightly sloped. Down in pasterns is a serious fault. Leg bones clean, graceful, but not too fine. Extremely heavy bone is as much a fault as spindly legs. One must look for substance and suppleness. Height at elbows should approximately equal distance from elbow to withers. 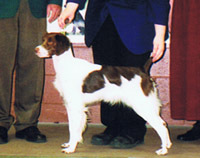 Feet -- Should be strong, proportionately smaller than the spaniels', with close fitting, well arched toes and thick pads. 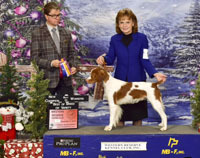 The Brittany is "not up on his toes." Toes not heavily feathered. Flat feet, splayed feet, paper feet, etc., are to be heavily penalized. An ideal foot is halfway between the hare and the cat foot. giving the angulation necessary for powerful drive. Hind Legs -- Stifles well bent. 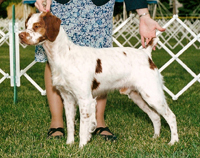 The stifle should not be so angulated as to place the hock joint far out behind the dog. 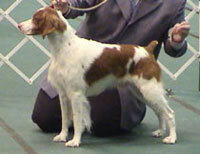 A Brittany should not be condemned for straight stifle until the judge has checked the dog in motion from the side. 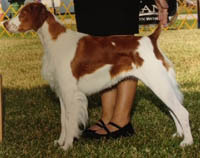 The stifle joint should not turn out making a cowhock. Thighs well feathered but not profusely, halfway to the hock. Hocks, that is, the back pasterns, should be moderately short, pointing neither in nor out, perpendicular when viewed from the side. They should be firm when shaken by the judge. Feet -- Same as front feet. thus diminishing punctures or tearing. A skin so loose as to form pouches is undesirable. 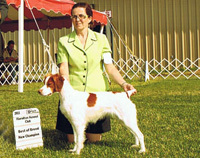 Orange and white or liver and white in either clear or roan patterns. Some ticking is desirable. 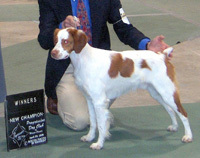 The orange or liver is found in the standard parti-color or piebald patterns. Washed out colors are not desirable. Tri-colours are allowed but not preferred. 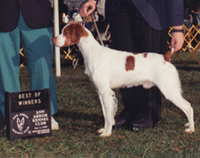 A tri-color is a liver and white dog with classic orange markings on eyebrows, muzzle and cheeks, inside the ears and under the tail, freckles on the lower legs are orange. Anything exceeding the limits of these markings shall be severely penalized. Black is a disqualification. which is smooth, efficient and ground covering. ©2008 - 2017 Michigan Brittany Club. All rights reserved.